After its galactic 42nd issue, The Funding Crowd is back with a somewhat shorter, but by all means no less interesting instalment. Today's menu consists of some good-looking Gems as starters, followed by the outcomes of our picks in previous issues, as well as the state of the still ongoing campaigns, and finishing with a nostalgia-inducing Biggie as a dessert. Nephil's Fall is a great looking metroidvania platformer, which takes a unique approach to the genre by flipping the RPG mechanics on their head. Instead of simply unlocking abilities as you progress through the game, you gradually have to make tough choices about which abilities to sacrifice. The protagonist Nephil is an ancient guardian who has sworn a duty to protect the four essences of fire, water, earth and wind, which give life to the world. However, dark forces manage to put Nephil in a state of coma, and while he's unconscious, they get away with the essences. When Nephil awakens, he realizes that he has failed his task, and that the absence of the essences has corrupted the world around him. He must set out to reclaim the essences, so that he can return them to nature and restore the balance. Nephil, right after waking up and realizing the essences have been stolen. At the beginning of the game, Nephil is equipped with four armor pieces, which are linked to a unique essence power. Each of these give Nephil control over a specific essence which corresponds to an ability, like ground slam and throwing fireballs. At certain points in the game there are portals, where you have to temporarily leave an armor piece to pass through, thus making you momentarily lose its linked ability. In addition to this, you will gradually have to permanently sacrifice armor pieces to nature, which means you'll get weaker as you make your way through the game. What makes these choices especially interesting is that you'll have a choice in which essences to do without, meaning the game might be significantly different on two separate playthroughs, depending on which ability you drop at which point in the game. The campaign is currently at over $25k of the $30k target, and with about a week to go, it looks set to cross the finish line comfortably during the week. If you want to contribute to receive updates from the project and get a copy of the game when it's finished, you can do so by pledging a minimum of $15 to the campaign. Much like Vincent Vega's account of his European trip, the best about Deadwood: The Forgotten Curse are its little differences. At first glance it could be readily dismissed as yet another zombie game, and it's true, it certainly is a zombie game. Buuut... its zombies -the titular Deadwood- are not your run-of-the-Unity-asset-store walkers, but cutesy cartoony little fellas made out of wood. Sure, it implements the typical day-night cycles in which you've got to explore and scavenge during the day and fight hordes of zeds at night. Buuut... this game at least provides us with a plausible explanation: Lathe, the teenage woodling protagonist is accompanied by a stone giant named Roguard. Honoring his name Roguard protects the young hero from the undead during the day, but when the night arrives he inevitably falls asleep and the poor Lathe must fend for himself against the Deadwood --and in turn protect his daytime guardian. Described by its creators as a blend of adventuring Zelda-style and survival à la Don't Starve, Deadwood was conceived as a quirky and cute open world game with some twists, including the aforementioned Don't Starve as well as Tim Burton's universe as inspirations for the darker bits. And the art style and animations are beautiful indeed (you can see for yourselves in any of the multiple production videos they've shared in the campaign updates). Oh, what a beautiful and woody-zombie-devoid landscape! Even though the story seems tailored for a co-op experience, gameplay-wise the game seems to be single-player only --at least at the moment and future stretch goals notwithstanding. Right now though stretch goals look like a distant utopia at best, with half the campaign gone by and merely a third of the funding goal raised. A real shame, as the shown concept and art are totally sound, and the devs have a shiny CV with experience at big companies like Dreamworks. We guess those little differences are not enough anymore to attract the masses in this post-boom crowdfunding era of today. To those of you who are more observant and appreciative of little things, know that $11 will secure you a Steam key/DRM-free copy of the game, plus a manual and a survival guide. But if you can afford to up your contribution to $100, a physical IndieBox copy of the game will be yours (including a t-shirt, some signed postcards, and several other digital goodies, in-game or not). If our previous Gem is struggling to attract attention and funding, this one is having a much easier time in this respect: it's only halfway through its campaign and the raised amount is currently nearing the 300% mark. In light of this huge success, one can only conclude that Halcyon 6: Starbase Commander must be something that appeals to a broad audience. Let's see... It's described as "a rogue-like sci-fi strategy survival game with base building, tactical combat, crew management and emergent storytelling". Yep, we can definitely see at least some of these aspects being of interest to any gamer. Its list of inspirations includes hits present and past such as Star Control II, Master of Orion, the X-COM and Civilization series, or roguelikes like FTL. 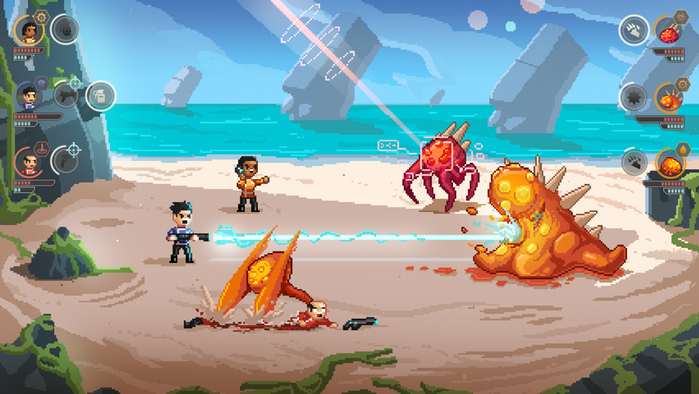 The result of this mixture is something not unlike a glorious pixel-art 4X strategy game, with base building, crew management, exploration of a big galaxy inhabited by multiple alien races, deep tactical combat (both with fleets in space or with individual units on the surface of planets), and above all lots of story events that shape the narrative of the experience. Why is always the redshirt the first to fall? As you can imagine, having nearly tripled the base goal means that many stretch goals have already been unlocked. Most of them went towards adding new content of all kinds (more lore, more events, more alien races, more crew classes for existing races, etc. ), but there are others like New Game+ and ship customization options. Modding tools lie in the immediate horizon, behind a soon-to-be-reached $160kCAD goal. The bad news is that, even though a Linux version is guaranteed, it won't be available on our OS for Early Access (which will take place on Steam only). After that, the final version will be released DRM-free as well, and on Windows/Mac/Linux. With only a day left to go, the Ace Attorney inspired visual novel Regeria Hope has finally gained some momentum and has rushed past its $6k goal over the last few days. If you act quickly, you can still help this campaign reach its $8k voice acting goal. 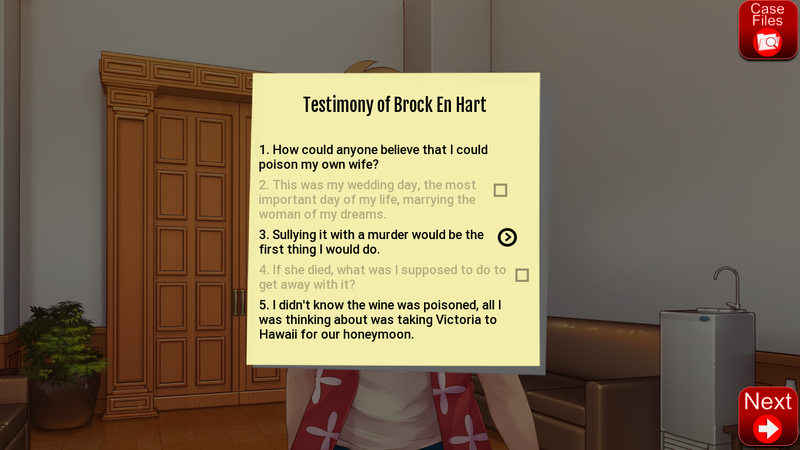 Like the Ace Attorney series, much of this game is centered around courtroom proceedings, but it differs from the popular Capcom games in that you will be faced with choices that may affect your current case and also have a ripple effect throughout the five planned episodes of the game. You also get the opportunity to prepare your witnesses by selecting which statements they should make in court, and in which order they should be made. Regeria preparing -not so efficiently- her defendant's testimony. The first episode of the game is available for free from itch.io, though if you like the game you might consider paying a little for it or contributing to the campaign. A modest $3 will get you a copy of Episode 2 when it's done, while paying $12 or more will give you access to all episodes as they are released. The developers are by their own admittance not very familiar with Linux, but the game is being developed with Ren'Py, which seems to work nicely on our favourite OS. There's also a Steam Greenlight page for the game that could do with some votes. Now please follow us to the next page to know the fates and struggles of our former picks, and to discover this issue's Biggie! I hadn't looked Into Deadwood before, since I'm not a fan of zombie games, but that looks very interesting. However, now when you have opened my eyes to both "Halcyon6" and the possibility of "Dungeons of Aledorn", I do feel a bit better. Thanks ! Me too. I had planned to write up that one, but with so little time left of the campaign and so long to go to reach funding, it wasn't worth it. could be the first JRPG(like) to come to linux. 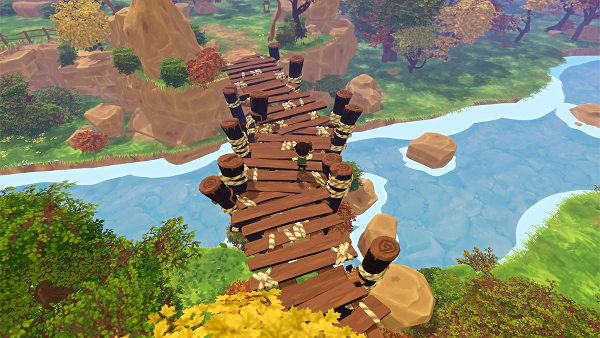 Another one that I wanted to write up, but decided against when it wasn't doing so good is The Song of Seven – a Zelda-esque, story-rich puzzle adventure. They are currently at less than $6000 of their $8000 goal with a little over a day to go, but they did get a notice written up on Destructoid yesterday, so maybe that'll give them a much needed upswing at the end of their campaign. The Halycon 6 game is marketed by Square Enix corporation (Final Fantasy, etc) so that should explain the mystery behind their rapid funding. notpatchman The Halycon 6 game is marketed by Square Enix corporation (Final Fantasy, etc) so that should explain the mystery behind their rapid funding. True, I forgot to mention it in the writeup. They took part in the Square Enix Collective program and are being helped by SE on marketing and PR, so that could truly be an important factor in its success. flesk Another one that I wanted to write up, but decided against when it wasn't doing so good is The Song of Seven – a Zelda-esque, story-rich puzzle adventure. They are currently at less than $6000 of their $8000 goal with a little over a day to go, but they did get a notice written up on Destructoid yesterday, so maybe that'll give them a much needed upswing at the end of their campaign. A massive rush of pledges over the last day brought this one well past its goal, and it still has a couple of hours to go!